Should I Have my Home Re-wired? Most American homes, built in the late 1950’s to present, will have PVC non metallic (Romex) style wiring. Before the 1950’s, home wiring was a tar covered fabric wire that becomes stiff and inflexible over time. Ultimately it becomes brittle. If there is any heat build up in the older brittle wire, it becomes a fire hazard in the home. Even if your older home does have compliant PVC non metallic (Romex) style wiring, it is very possible that the outlets have no grounded conductor present. This is incredibly dangerous, especially for the young and the elderly, as these age groups are much more prone to injury or even death from electrocution. 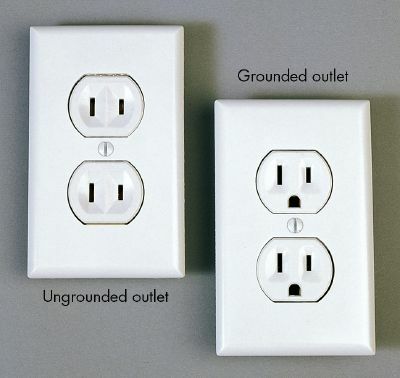 To identify an ungrounded receptacle: an ungrounded receptacle only has two slots on it and no round hole for the ground pin on the plug. See the image below for an example. If your home has outlets that look like the one on the left, then you will need at least partial re-wiring at your home. Sometimes the condition of the home can lead to the need for a re-wire due to physical damage (examples would include flooding, fire or just neglect from previous owners). This is particularly true if the home has a history of being a rented property. Also, if non metallic cable (Romex) gets wet or damaged from fire, it will have to be replaced. Sometimes the home’s electrical layout does not suit the new owners. They may want to put furniture where the receptacles are currently located and change where the switches are positioned. If the home is older, it will likely have a lot less outlets then are required by the present standards, and a re-wire is often the best option in this instance. 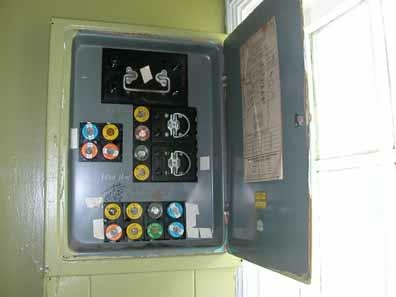 Old breaker boxes that have glass fuses (as pictured below), should be replaced with a modern panel that uses circuit breakers. Old fuses aren’t as safe, not as sensitive under short circuit conditions and are inconvenient. Click on the picture below to visit our service panel page. If your home has any of these wiring concerns, British American Electric recommends having one of our professionals come and do a free estimate. Call us today!